Our next meeting will be held on Wednesday, April 3, 2019, at 7:00 pm, at St Theresa, the Little Flower Church, 15 Still River Road, Harvard, MA. 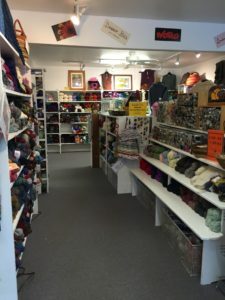 If you haven’t already sent your email to Elaine Swee indicating the type of yarn and the number of skeins you are planning to purchase, please click here to email us.Elaine needs to give Jerry an estimate of how much yarn to prepare and bring to our meeting. He usually brings extra yarn in case you would like to purchase some additional skeins. Please bring gloves and an apron. 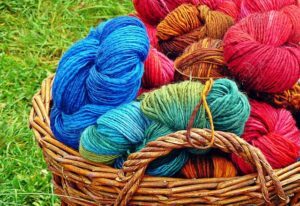 Jerry will also be bringing along a selection of his gorgeous hand dyed yarn for sale during the meeting. Our group welcomes knitters of all skill levels, including beginners. Do you only crochet? We welcome you as well. For more information, click here to email us. Our next meeting will be held on Wednesday, March 6, 2019, at 7:00 pm, at St Theresa, the Little Flower Church, 15 Still River Road, Harvard, MA. We are pleased to have our own Edith Murphy teach us Portuguese knitting. Edith had been at Classic Elite Yarns, ending as the production manager when CEY closed. She also worked and taught at Hub Mills Store, designed, and did technical editing. She is currently running her own business, Moss Brook Fiber Arts, which includes teaching knitting and crochet at the Chelmsford Center for the Arts, and running the Yarn and Soul yarn line. Edith would like everyone to bring a swatch of approximately 30 stitches cast on and purled for 3 or so rows (garter in purl). You can use any weight yarn from dk to chunky along with the appropriate size needles. Also, please bring another set of needles and a ball of yarn for learning the Portuguese cast-on. Edith will have a selection of her Yarn and Soul yarns that she will be selling at a 10% discount for the evening. We are proud to announce that two of our guild members won awards in the fashion show at the recent New England Textiles Network Spa Knit and Spin in Freeport, ME 2019! Brigitte Bovy came in second place for the gorgeous shrug she knitted and Susan Miles came in third place for the amazing sweater she was asked to knit. Congratulations to both!! Our next meeting will be held on Wednesday, January 2, 2019, at 7:00 pm, at St Theresa, the Little Flower Church, 15 Still River Road, Harvard, MA. We have a fun evening planned! 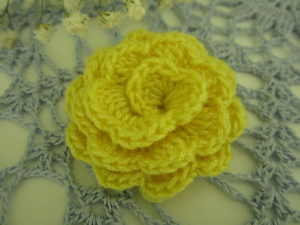 Lynn Cooke is going to teach us how to make knitted and crocheted flower embellishments. She will be supplying patterns and information, and DK/sock weight yarn. Please bring one set of knitting needles, either circular or straight, size 2 or 3, and if you desire, a crochet hook, size 2 or 3. If you have a favorite yarn, you can bring a small amount of that along with the appropriate size needles/hook. Also, John Griswold and Lynn are going to show us how their electric spinners work. Our next meeting will be held on Wednesday, December 5, 2018, at 7:00 pm, at St Theresa, the Little Flower Church, 15 Still River Road, Harvard, MA. We are delighted to welcome back Tammi Davis. Tammi is going to teach us how to felt a sheep and will be providing needle felting kits for $5. Prior to our meeting, we invite you to join us at 6:15 pm for our optional Holiday Yankee Swap. If you choose to participate, please bring a knitting themed, wrapped gift valued at up to $20. Don’t forget to bring any finished charity knitting. Membership dues is $25 a year. Guests may attend this meeting for a charge of $10. Our next meeting will be held on Wednesday, November 7, 2018, at 7:00 pm, at St Theresa, the Little Flower Church, 15 Still River Road, Harvard, MA. We are pleased to welcome Sarah Monroe of Subito Farm in Concord. Sarah is bringing along a trunk show of their latest creations and will have some of their original patterns and hand-dyed yarn for sale. Please bring along any finished charity knitting. Our next meeting will be held on Wednesday, October 3, 2018, at 7:00 pm, at St Theresa, the Little Flower Church, 15 Still River Road, Harvard, MA. We are excited to welcome Alasdair Post-Quinn of Fallingblox Designs for the evening! Alasdair is a knitwear designer and author specializing in double-knitting. Double knitting is a technique that creates a fabric with no wrong side. Alasdair is going to show us his own innovative take on double-knitting as well as discuss his books. For more information about double-knitting, please visit his website double-knitting.com. Membership dues are $25 a year. Guests may attend the meeting for a $10 fee. Our first guild meeting of the year is scheduled for Wednesday, September 5, 2018, at 7:00pm. 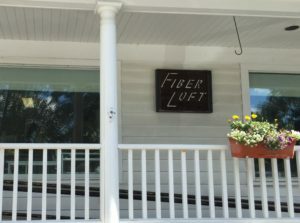 Instead of gathering at The Little Flower Church, please join us at The Fiber Loft, 9 Massachusetts Ave, Harvard. This is going to be a jam-packed meeting! We’ll start the night with highlights of the upcomming year we have planned. We are quite excited about our programs! You ask for it, so we’re bringing back charity knitting. Sheilah Johnson will go over the guidelines. We already have a decent collection of yarns for us to knit or crochet with, but please feel free to donate more. Preferred yarns are acrylic, acrylic/wool blends and cottons. Yarns should be soft and machine washable/dryable. Simple patterns for hats, mittens, scarfs, premie and chemo caps, and blankets are needed as well. Lynn Cooke is going to be presenting a NVKG scarf pattern that she has written just for us! 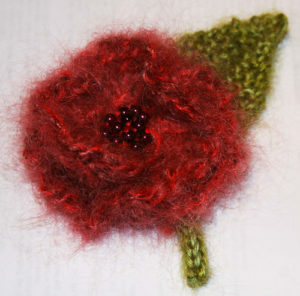 If you would like to knit this, you can shop for yarn that night. Suzanne Kelly, of the Fiber Loft, has arranged for a KFI (Knitting Fever Inc) trunk show featuring their latest yarns, including Noro. As always, we encourage you to bring what you have been working on all summer for “show and tell”. New this year! Our revamped raffle is going to be revealed! Please join us for a fun evening! You can browse the store, which will be open for shopping. Remember, all guild members receive a 10% discount on yarn at both the Fiber Loft and Island Yarn in Maynard. Enjoy your summer! We’ll meet again on Wednesday, September 5, 2018. We have an exciting year planned for 2018-2019. For more information, please check back in August. In the meantime, happy knitting! Our next meeting will be held on Wednesday, May 2, 2018, at 7:00 pm, at St Theresa, the Little Flower Church, 15 Still River Road, Harvard, MA. We have the pleasure of welcoming back Judith Durant. Judith is the editor of the many One Skein knitting books, and founding editor of “Interweave Knits” Magazine and a contributor to “Interweave Knits”, “Beadwork” and “Piecework” magazines. She is also the author of several knitting and beading books. Judith’s presentation for the evening is “The Pleasure and Pain of Knitting for Broadway” in which she will share the story of how she was hired to provide 40+ men’s sweaters for a Broadway revival of Carousel, which opened on April 12. She recruited a small army of knitters, and somehow managed to make every deadline. Judith has a slideshow of pictures taken of some of the fittings and also of the sweaters onstage. She is bringing along a few of the local knitters she worked with so they can share their experiences with us. Membership dues are $25 a year. Guests may attend this meeting, but will be charged $10 to participate due to the speaker.